About 30 Sudanese women have been arrested for holding a protest march over a video which allegedly shows two policemen whipping a woman. The women were detained as they tried to hand a petition to the justice ministry in Khartoum. A Sudanese official has condemned as "shocking" the video, which has been widely circulated on the YouTube website. The BBC's James Copnall in Khartoum says flogging is a common punishment. Those convicted of crimes ranging from selling alcohol to "indecent dressing" or adultery are sentenced to lashes by Sudan's Sharia courts. 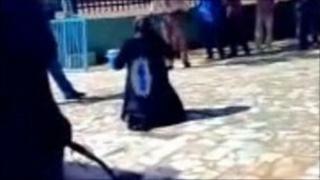 The video purports to show Sudanese policemen whipping a woman in front of a crowd, as she kneels on the floor, crying out. YouTube has removed some of the postings of the video but on Tuesday, it could still be easily found. "Humiliating your women is humiliating all your people," the women shouted as they were being arrested, reports the Reuters news agency. Less than two minutes after getting my microphone and recording equipment out of my bag, I was surrounded by hostile men. They wore plain clothes, but were clearly from a branch of the security forces. One grabbed my arm. Another gripped the microphone, trying to wrench it from my grasp. But a third man, wiry, tough, with a moustache, kicked at my legs. The move was so neatly executed, he might have been a judo champion. I fell backwards onto the pavement, and the men moved away with my equipment. One of the protesters walked past me, saying "sorry" softly under her breath. Then the plain-clothes security men decided enough was enough, and carted off the women to the police station. During the arrests, our correspondent was kicked to the ground and had his equipment confiscated. Some Sudanese officials have said the video is not genuine but Khalid al-Mubarak from Sudan's London embassy said: "It is a shocking video." He quotes the governor of Khartoum province as saying that the policemen should be punished and dismissed. He says the women is accused of being a prostitute but told the BBC's Focus on Africa programme: "Whatever the crime, what the policemen have done on the video is wrong, is unacceptable and is shameful." Mr Mubarak said corporal punishments are part of Sudanese law but "there are restrictions". Last year, a Sudanese journalist was fined for wearing trousers but said several of her companions had been whipped after pleading guilty to contravening indecency laws. Sharia, or Islamic law, has been implemented in Sudan since 1983. The introduction was one reason why people in the south, where most people are Christian or follow traditional religions, took up arms against the Arabic-speaking, Muslim north. After a 2005 peace deal, a referendum is due in January on whether the south should secede from Africa's largest country.